Adopting an energy-efficient lifestyle will not only save you money on your electric and/or gas bills, but it also will help the environment by releasing fewer greenhouse gases and creating less of a demand for non-renewable energy resources, such as coal, petroleum (crude oil), natural gas, and propane. According to the Department of Energy's Energy Information Administration in 2018, 75% of energy consumption in the United States comes from fossil fuels. The rest of the United States energy consumption comes from nuclear and renewable resources, such as geothermal, solar, and wind. So what are some ways that we use energy? The energy we use every day in our homes creates a high demand for energy resources and costs us a lot of money. A survey conducted in 2015 calculating the amount of energy a household spends in a year. The average home spent $1,856 a year on energy. What areas of energy consumption in the home cause Americans to spend so much money on energy? Much of the energy used in the home is for space heating, appliances, and lighting. We also use a lot of energy resources for transportation. According to the U.S. Federal Highway Administration, there were 4,142,414 registered vehicles in the United States in 2017. Each time we drive, we release greenhouse gases into the air and use energy to power our vehicles. If you are curious as to how large of an impact you make on the environment through energy consumption, you can calculate your carbon footprint. Carbon is a good indicator of how much of an impact an individual or household makes on the environment because it's a major greenhouse gas. Go here to find out what your carbon footprint is. 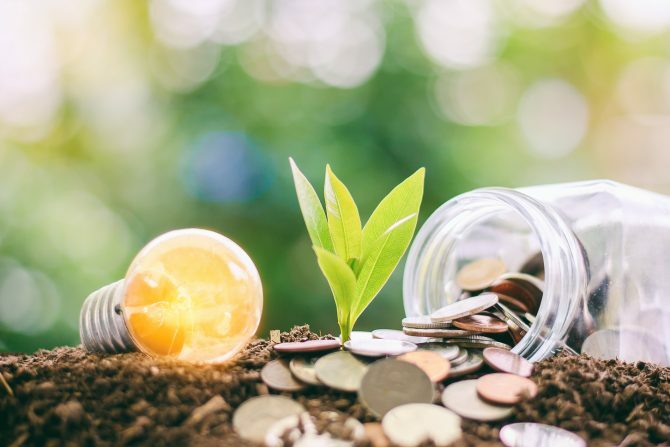 There are many ways, which range from the inexpensive to the expensive, to lead a more energy-efficient lifestyle and to lower your carbon footprint. Here are some tips for lighting control, heating and cooling your house, and more (from energystar.com). Remove unnecessary lamps in overlit areas. Check your light levels against standards from the Illuminating Engineering Society (IES) to see if you have areas that are over or under lit. Unplug your appliances when not in use. Many appliances have an "instant on" feature that causes the appliances to constantly use electricity. Televisions, DVDs, other electronics that use remotes, microwaves, computers, and other electronics can use between 2 and 10 watts of power when even if it is turned off but still plugged in. In the summer, set central air conditioning units as high as is comfortable. You will save between 6 and 8 percent on your electric bill for each degree above 78, but be careful that you do not overheat or become dehydrated during periods of extreme heat. In the winter, wear warm sweaters and socks and set your thermostat no higher than 68 degrees and you will be more energy efficient and save money. Do be careful not to set your thermostat too low; if it's too cold for you even when you've dressed appropriately, turn up the thermostat to a comfortable temperature. Switch to buying local foods as often as possible. Since food grown locally doesn't need to travel a long way to reach the consumer, less energy is spent on transporting the food. Make sure that your car tires are properly inflated. Properly inflated tires improve mileage and are safer to drive on. Many gas stations offer air to fill your tires at no charge. Switch light bulbs inside and outside the home LEDs, or a light-emitting diode. They have many advantages over incandescent light sources, including lower energy consumption, longer lifetime, smaller size, and faster switching. Use a timer or motion detectors for outdoor lights. With either of these devices, you will only be using lights outdoors when needed. Apply door sweeps to the bottom of your exterior doors and weather stripping or caulking your doors and windows. This will prevent the outside air from coming in and your cool or hot air from escaping. Join a community supported agriculture (CSA) program. Individuals purchase shares in the farm(s) that are part of the CSA. Instead of receiving cash dividends like a person gets when buying a company's stock, shareholders receive fresh produce. Add insulation. Insulation will help prevent the flow of heat into or out of your home, thus putting less pressure on your HVAC system to maintain a constant temperature. Install ceiling fans. Using ceiling fans in warm weather will use less energy than air conditioning. When buying a new appliance, look for the Energy Star label. Energy Star products use less energy than most appliances. Energy Star is a joint effort of the Environmental Protection Agency and the U.S. Department Energy. Install solar panels for energy. While solar systems can cost quite a bit of money at the outset, they can vastly reduce the amount of electricity you will need to use. There are also incentives and rebates offered by many local and state governments for using solar energy. To find out if you qualify for any incentives or rebates, check out www.findsolar.com. If you are planning on building a house, consult a green architect. Green architecture maximizes the effect of natural light and uses alternative, renewable energy sources, such as solar and wind power. Alternative energy is very much in the news, both nationally and locally. Learn more about these less traditional energy sources. Books to help reduce your carbon footprint, produce less waste (maybe even zero waste! ), and leave a livable planet for our children.